First, open your Start Menu/Tile Menu. 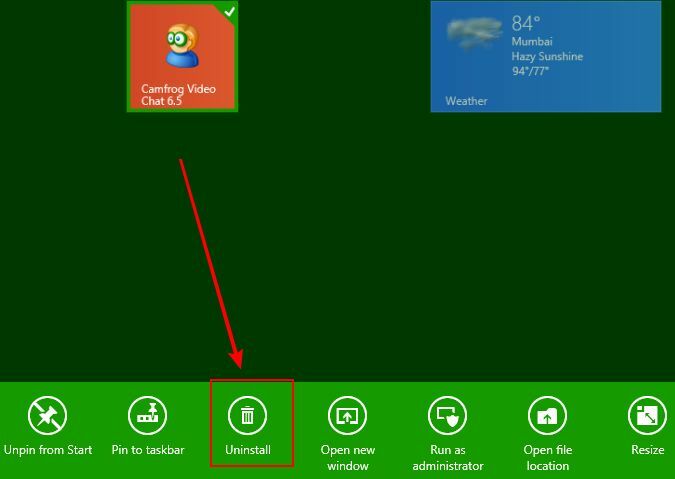 Find the Camfrog Video Chat icon, and right-click on it (or tap/hold if you’re using a touchscreen) to bring up the menu on the bottom, then press the “Uninstall” button to uninstall Camfrog. After you have completely uninstalled Camfrog, visit http://download.camfrog.com to download and install the latest version of Camfrog. ← Thanks for 10 Frogtastic Years! whether it is really running on Windows 8 …? The problem I had was with a message regarding the IM history. I just deleted the IM history file, and the other one it had created, and it was fine. No messy uninstall needed. Well Done!! Finally Camfrog for Win 8.1 comes up! I will try this version in near future. Keep Progressing! when will mac version of camfrog get an update .